It has been a few years since I felt the need to peruse any resource material for helping me find the right people. In a previous career I had hired and managed between 80 and 100 people at a time. But I thought I might want to brush up on what changes have transpired over the last 15 years and I couldn't believe what I learned from this book. I picked it at random from the endless supply of other choices and I was very glad I did. These two writers hit upon everything that I thought I knew and opened my eyes to the changes that I was not aware of. To be honest, I wasn't planning on reading the entire book but thought I would hit upon the "highlights." I actually thought I knew enough to skim it but little did I realize, I knew very little. 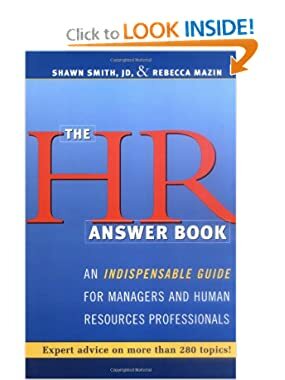 And even though I don't run a large office like I used to, I found the book to be an easy read and will keep it on the shelf as a resource guide. I tend to bend the pages of my books for the passages that I know I will refer to in the future and this book looks like I have had it for years with the bent corners. I don't think I will find it necessary to look beyond this guide in the future. My hats off to these two writers who very much know their subject and will be "indispensible" to me.